HoverJack® Air Patient Lift is recognized as the industry standard for safe patient lifting, the HoverJack® Air Patient Lift allows caregivers to safely lift patients who have fallen without gathering a lift team. The HoverJack® inflates to lift patients from the floor to bed or stretcher height in a supine position, maximizing patient comfort and minimizing the risk of injury to both patient and caregivers. 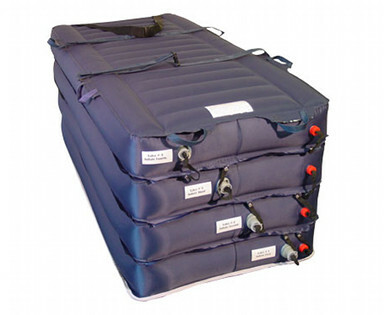 And once the HoverJack® lift is inflated, the HoverMatt® air transfer mattress can be used with the same air supply unit for safe and easy lateral patient transfer to a bed or stretcher. 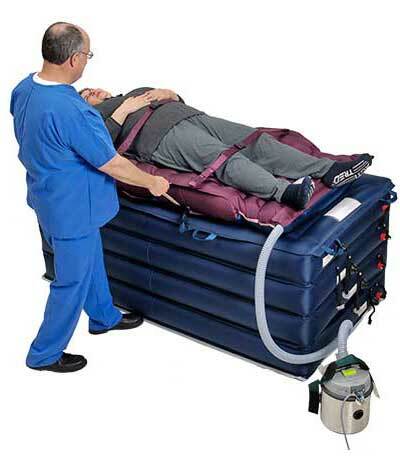 Hoverjack® Air Patient Lift - has a tested weight capacity of 861kg. Allows caregivers to safely lift any patient that has fallen without the need of a team of helpers. The Hoverjack® inflates to lift patients from the floor to bed or stretcher height in a supine position, maximizing patient comfort and minimizing further injury or stress to patient and the risk of injury to caregivers. Lift height is controlled through 4 individual inflation chambers which have self sealing valves. Has quick- release deflation valves which can lower the patient if needed. The Hovermatt® is best used in conjunction with the Hoverjack® to facilitate easy lateral transfer to the bed or stretcher. Same air supply motor is used for both Hoverjacks® and Hovermatt® systems. Hoverjack® has a teflon base and long strap which allows for the patient once on the Hoverjack® to be maneuvered easily from a confined area if required and across all surfaces. Reduce back injuries for nurses and caregivers. Minimize staff members needed to safely lift patients who have fallen. Lift height is controlled through four individual inflation chambers with self-sealing valves. Quick-release deflation valves lower the patient if needed. A Teflon® bottom allows for easy movement across all surfaces. The HoverJack® lift is available in two widths (32" & 39"), with a tested capacity of 1900 lbs. to accommodate most patients. Inflate Hovermatt®, release straps from Hoverjack®. One caregiver gently pushes the Hovermatt® to the new bed. The second caregiver uses a weight shift to pull patient to center of bed. Once mat is delated, deflate jack by carefully releasing red caps. 1. Clean mats and jack with PerCept wipes or Virox®. Clean Hoverjack® while inflated (top and sides), then deflate by gently releasing red caps ( STAND CLEAR as it is under high pressure) and clean the underside. To prevent airborne chemicals, do not wipe the underside of the mat while inflated.